During the depths of winter the last thing anyone needs is their boiler breaking down. That's where Boiler Services Dublin can help. Our emergency boiler repair service operates 24 hours a day, 7 days a week, 365 days a year. We are Dublin's largest independent boiler repair specialists. We have gained an outstanding reputation within the boiler and central heating industry. We have been trading in excess of 40 years. This means we have the experience and knowledge to have your heating system up and running again in no time. There have thousands of types makes and models of boilers manufactured within the last four decades, so experience is vital. You can rest assured that our specialist technicians can solve your problem. We have some senior technicians with over 35 years experience specializing solely with boilers. This means you are in safe hands. Why choose us for your emergency boiler repair? We are a large company. We always have a number of repair technicians on call located throughout Dublin. We will always take your call in a polite professional manner. We guarantee to have a technician at your business or home within an hour of your call. It doesn't matter what time of day or night it is. We do not operate a call out charge.We never apply any hidden extras. We have a very competitive upfront pricing policy. This means you will never get a shock when the bill arrives. 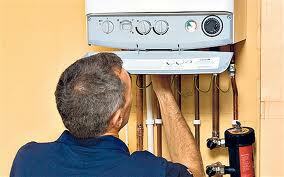 All of our emergency boiler repair technicians are R.G.I. registered. They are all fully qualified plumbers by trade. They just opted to specialize in boiler repair, servicing and maintenance. All of our work comes 100% guaranteed. We are comprehensively covered by our public and professional indemnity insurance. Our technicians are reliable and courteous. They are always fully focused on providing the best quality workmanship possible. Why choose a jack of all trades to deal with your emergency? When for the same or less money you can have a specialist. We deal with boiler repairs, service and replacement all day, every day. If your boiler breaks down at an inopportune time call us on 01-8326699. We will dispatch an emergency boiler repair technician straight away to fix the problem.